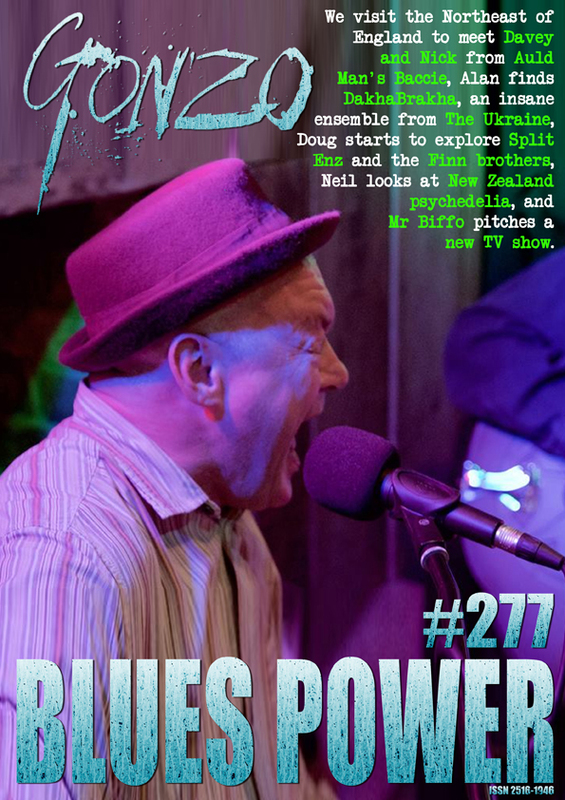 We visit the Northeast of England to meet Davey and Nick from Auld Man's Baccie, Alan finds DakhaBrakha, an insane ensemble from The Ukraine, Doug starts to explore Split Enz and the Finn brothers, Neil looks at New Zealand psychedelia, and Mr Biffo pitches a new TV show. Eric Burdon, Silver Fox Cafe, Elton John, Barbra Streisand, The Mind Map, Motorhead, Jeff Beck, Robert Smith's Meltdown, Strange Fruit, Friday Night Progressive, Canterbury sans Frontieres, Mack Maloney's Mystery Hour, NME, Jeff St John, Trevor Graham Baylis CBE, John Charles Kenneth Gardestad, Brandon Dean Jenkins, Ronald Lawrence Victor Prophet, Bill Burkette, Alexander Buchanan, Patrick Doyle, Barbara Dickson, Jessica Lee Morgan, Billion Dollar Babies, Rick Wakeman, Tangerine Dream, Auld Man's Baccie, David Curtis, Nick Phillips, Doug Harr, Split Enz, Alan Dearling, DakhaBrakha, Neil Arnold, New Zealand Psychedelia, Kev Rowland, Toothgrinder, Trepaneringsritualen, Tyler Bryant & The Shakedown, Until the Sky Dies, Veni Vidi, We Came as Romans, Wildness, World War Me, The Adicts, Apartment 213, Mr Biffo, Digitiser The Show, Roy Weard, CJ Stone, Hawkwind, Jon Downes, The Wild Colonial Boy, Martin Springett, ElectricNick, The Beatles, The Wonder Years. Strange and tumultuous days indeed. On Friday, whilst trying to do something sensible I actually did something inexcusably silly. I deleted all my Gonzo emails for the last three years, including loads of stuff which needed to be kept for the magazine. So, if you are one of the Gonzo people with whom I have been dealing, please forgive me when I have to chase you for stuff that I should have but don't. That is a very convoluted sentence but I think you probably know what I mean. But on the good side (and believe me this is very good, at least as far as my own mental health is concerned). ON THIS DAY IN - 1496 - Jews were expelled from Syria.